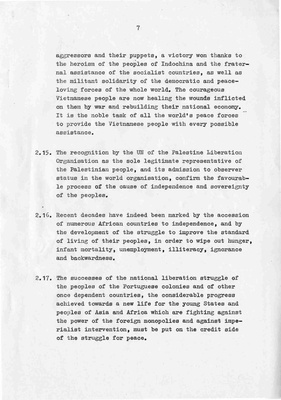 "International Women's Year, Berlin Paper, page 7"
From the papers of Dr. Usha G. Mahajani, this is page seven of a working paper from Commission VI of the International Women's Year World Congress in Berlin, October 1975. The page discusses women, worldwide peace and the UN's recognition of countries standing up to imperialist intervention. Peace is a focus of the Commission along with detente, international security and the environment. Mahajani, a Political Science professor at Central Washington State College [CWU] from 1967-1978, attended the IWY Congress as a delegate for India. "International Women's Year, Berlin Paper, page 7" (1975). Washington State Conference for Women, 1977. 252.